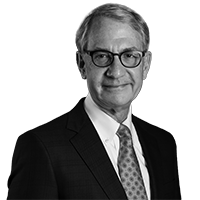 With over forty years of experience, Scott litigates complex commercial and regulatory cases. His clients include business corporations, colleges and universities, and dozens of governmental entities, from coast to coast. Scott has built a national airport practice, representing over 100 governmental airport owners in federal regulatory compliance matters, civil litigation and airport-airline negotiations. As an active participant in the civil rights community, Scott frequently takes on politically-charged cases. He came to Anderson & Kreiger in 2006 from Palmer & Dodge. Litigated a case involving a claim in the hundreds of millions of dollars overseas for Genzyme. Won a campus free speech case for Tufts University in the SJC. Represented Fidelity Investments in a precedent-setting case involving artists’ moral rights in the First Circuit and SJC. Served as lead counsel to 46 states in billion dollar tobacco litigation. Litigated one of Massachusetts’ leading consumer class actions in the Supreme Judicial Court. Served as lead counsel in many prisoners’ rights actions involving free speech and conditions of confinement. Defended a municipality’s ban on nerve gas testing by the U.S. Army. Successfully defended a claim by the City of Ontario, California that its sale of Ontario International Airport to the City of Los Angeles was null and void. Litigated closely-watched precedent-setting cases for airport owners, including leading antitrust and RICO cases in the First Circuit, an important preemption case in the Third Circuit and rate-setting appeals in the D.C. Circuit. Successfully defended numerous regulatory complaints at the FAA. Scott speaks at conferences throughout the United States on complex litigation and airport regulation. Scott has taught a seminar at Columbia Law School and spoken at various conferences about the moral rights of artists.